Protein may get a lot of attention as a muscle-building nutrient, but you need carbohydrates for energy to help you meet your lean-body goals. Bread is a good source of carbohydrates, but not all types are equally beneficial. Choose 100 percent whole wheat bread, rather than white bread, to obtain essential fiber and other nutrients for a healthy, muscular frame. A study published in the 2004 issue “Sports Medicine,” concludes that bodybuilders should follow a diet composed of 55 to 60 percent carbohydrates, 25 to 30 percent protein and 15 to 20 percent fat in both the off-season and pre-contest phase of training. For a 2,500-calorie diet, that amounts to approximately 375 grams of carbohydrates daily. Even if you do not plan on showing your muscles on stage, eating too few carbohydrates can leave you feeling drained at workouts and prevent you from performing long exercise sessions to build muscle. A typical slice of white or whole wheat bread provides 12 to 15 grams of carbohydrates and is an easy way to help you meet your carbohydrate needs. Athletes looking to build muscle should make most of their carbohydrates fiber- and nutrient-rich, says registered dietitian and sports nutrition specialist Nancy Clark. Bread made with 100 percent whole wheat flour has more naturally occurring B vitamins and fiber than highly refined white bread. Some forms of whole wheat bread, especially sprouted grain varieties, contain greater amounts of muscle-supporting protein than white versions. 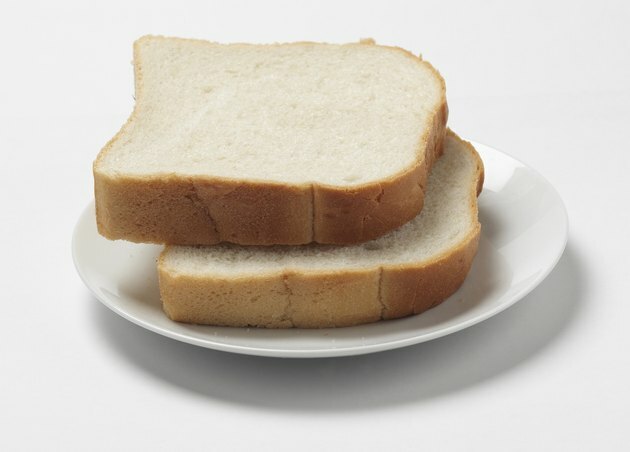 White bread is made with highly refined grains, meaning much of the outer coating of the wheat kernel has been removed and, with it, most of the nutrients and fiber. Without fiber, your body digests the bread quickly, causing a jolting rise and fall in blood sugar. As a result, you become hungry sooner and may end up craving more carbohydrates and exceeding your daily calorie intake for the day. Your body stores an excess of calories as fat, rather than muscle. White breads often contain added sugars, including high fructose corn syrup, and other ingredients that also contribute to fat accumulation. Just because a bread says "whole wheat" on the label does not mean it is good for you. Many breads labeled “whole wheat” are made primarily with refined white flour with just a bit of whole wheat or whole grain flour mixed in. Look at a bread’s ingredient list before making a purchase. “Whole wheat” or “whole grain” should be the first ingredient. The bread you choose should also have a minimum of 2 grams of fiber per slice. When choosing whole wheat bread, also pay attention to the amount of sodium per slice. Go for brands with 200 milligrams or fewer per slice. Too much sodium can cause bloating and water retention, which can make your muscles appear less defined. Muscle and Fitness: Which Breads are Best for Bodybuilders? What Is a Good Body Fat Percentage for a Bodybuilder?